Whether you have found your dream home and plan to stay in it forever, or are planning to sell soon, a new paint job will have it looking and feeling fresher without breaking the bank. If you plan to sell your house, home and garden television advises you to spruce up your home’s exterior, increase curb appeal and ensure you get potential buyers through the door. DIY can be difficult to get the hang of. The better prepared you are, the more likely you’ll achieve the desired look for your home. Let’s take a look at the main things to think about before you start your project. If you plan on staying in your current home, you have the freedom to get as creative as you like with your painting. To freshen things up for a resale, you have to consider future buyers’ tastes. Of course, you are never going to know exactly what someone likes, but creating a neutral, fresh canvas is the best approach. White and cream are great options; creating a light and clean look, that easily molds into different themes. Look to Benjamin Moore’s site for resources on exterior painting. You need a variety of tools to give your house a professionally painted look. Don’t try to make do with random things in your shed. For safety, use a sturdy ladder. If you don’t have one, rent ladders or scaffolding from a place like Sunbelt Rentals. Prep the outer surface of your house by sanding any flaked paint and cleaning it thoroughly. Fill in and sand down any holes. A little research can help you determine which types of paint are best for your house surface. Most paints are either oil or latex-based. Latex paint is the most durable and easy to clean up. It is also more breathable and fade resistant. If your house has a buildup of former oil-based paint on the surface and the temperature in your area is less than 50 degrees Fahrenheit, use oil-based paint. Essential to avoid messy splatters and spills, make sure you cover up floors and furniture close to where you’re painting. Use large canvas drop cloths or plastic sheets. Be aware of the slip factor under your ladder while painting. Use painter’s tape to protect trims and ceilings. Without this tape, even the steadiest hand can easily make a mistake and will add time onto the job. 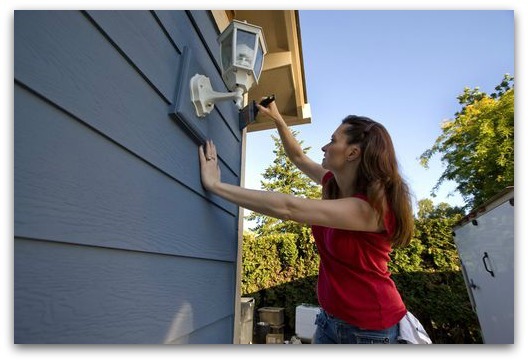 With the right equipment and precautions taken, you can give your home a new, fresh look. Have fun with it and challenge yourself to take on the project yourself. A little investment, some new paint and a free weekend can increase your house’s resale value.